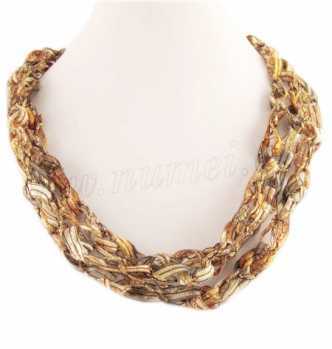 These crocheted ribbon necklaces are absolutely dazzling and gorgeous! They look like shiny beads and/or chain links, and are lightweight and very eye-catching. Everyone who has seen these ribbon necklaces love them. Handmade ladder ribbon necklaces make great gifts for any occasion. Care: Hand wash, roll in towel to remove excess water, lay flat to dry.